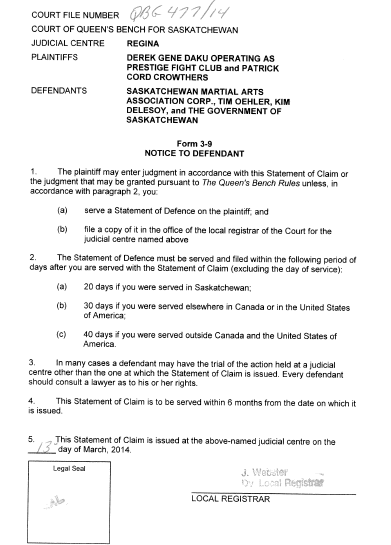 Following criminal charges being laid after hosting an amateur mixed martial arts event without SMAA approval, the Prestige Fight Club has now sued the Provincial Government and the SMAA. “a. Restricting the sanctioning of amateur mixed martial arts events to its own members, who are selected to the SMAA in an arbitrary and unfair manner. b. Denying the public at large, including non-SMAA members and the Plaintiffs, the means and ability to host amateur mixed martial arts events in a legal manner or at all. The lawsuit further alleges that the Provincial Government was negligent in granting the SMAA regulatory power to oversee amateur MMA in the Province and further that it failed to properly oversee the SMAA’s use of power. Prestige is not only seeking damages for “nullified business opportunities” but also aggravated damages, exemplary damages and further seeks to strip the SMAA of their regulatory powers arguing the SMAA made “false, inaccurate or misleading” representations to the Government in the process of obtaining their regulatory powers. I should note that none of the allegations have been proven in Court and the Defendants are expected to file their reply to the lawsuit shortly. Without weighing in on the merits of the lawsuit there is one point worth stressing for those who follow regulatory issues in Canadian MMA. Even if all of the allegations are true these likely do not excuse hosting an MMA event without approval from the body designated by a Province to oversee such events . In the event of wrongful denial of a licence to host an MMA event the proper course would be to challenge the regulatory bodies decision through judicial review. Going ahead with an event without complying with the requirements of section 83 of the Criminal Code can give rise to prosecution and despite this lawsuit the Criminal charges following Prestige’s September 28 event remain before the Courts.